One of the most famous stories surrounding Van Gogh is that the artist cut off his own ear in December of 1888, shortly after a violent argument with his friend and fellow artist Paul Gauguin. Reportedly, Van Gogh then gave the ear to a local prostitute, a woman named Rachel. Due to the popularity of this story, I think that Self Portrait with Bandaged Ear (c. 1889, shown left) is one of the painter’s best-known self portraits. 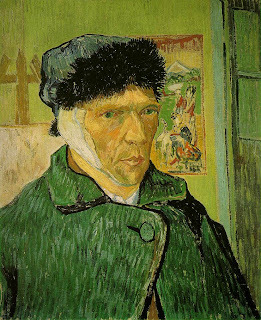 An interesting (and rather incredulous, in my opinion) theory came out earlier this year about Van Gogh’s ear cutting. You may have caught wind of this new theory – in May it was picked up by all different newspapers and sites. Hans Kaufmann and Rita Wildegans’ new book, In Van Gogh’s Ear: Paul Gauguin and the Pact of Silence argues that Van Gogh did not cut off his own ear, but rather Gauguin was the culprit. Kaufmann and Wildegans believe that Van Gogh and Gauguin were fighting about Rachel (the prostitute). According to this theory, the men agreed to invent the story of self-mutilation so that Gauguin would not get in trouble with the authorities. Gauguin eventually moved to Tahiti and Van Gogh committed suicide in 1890. You can read more about this new theory in these articles by the Daily Mail and BBC News. Personally, I have a hard time accepting everything put forth by Kauffman and Wildegans. I kind of like the idea that Rachel was the source of the argument, especially since we know that Van Gogh gave Rachel the infamous ear afterwards. However, I’m not sure that Gauguin would have been the one to slice Van Gogh. I agree with what Jonathan Jones wrote to attack this theory. After Gauguin left, he wrote Van Gogh and asked for the Sunflowers painting a parting memorial gift. I don’t think Gauguin would have had the gall to ask for a momento if he had recently cut off his friend’s ear. That doesn’t make sense to me. What Do You Think of Dalí? I have to admit that when it comes to aesthetics, Salvador Dalí’s art doesn’t do much for me. And honestly, I don’t think I know anyone who finds Dalí’s work to be aesthetically-pleasing. Most people I know have described Dalí’s art as cerebral, Freudian, or just plain weird. 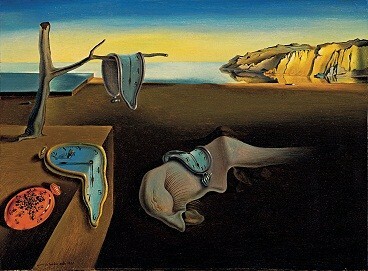 Don’t get me wrong, I think that Salvador Dalí’s art has a significant place when it comes to art history. I think it’s great that most art history students are introduced to The Persistence of Memory (1931, shown above). I enjoy comparing Dalí’s work to other Surrealists and seeing how it fits in the grand trajectory of art.1 I also think it’s interesting to apply a Freudian interpretation to Dalí’s art. Aesthetically, though, I am drawn to the work of other Surrealists, like Miró and Magritte. Dalí really doesn’t do anything for me. I wonder about how important aesthetic was to Dalí. He obviously produced a distinct style – but I wonder if this wasn’t due to aesthetic taste but more-so for emphasizing an artistic statement (or perhaps so he could better market himself as an artist and commodity). I think I agree with Kieran – Dalí seems to be valued because of the incoherence and cerebral nature of his art, not because of aesthetics. I know that people have varying opinions on what makes something aesthetically pleasing or constitutes an aesthetic response (and Kieran even discusses this fact in hist article). In your opinion, do you think Dalí is “outside the sphere of aesthetic value?” C’mon Dalí fans, speak up and defend yourselves! 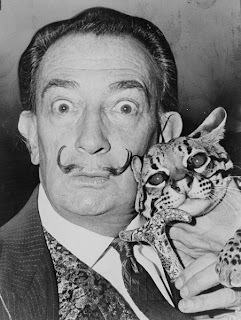 There has got to be someone out there who is aesthetically drawn to Dalí’s style, and I’d like to hear their reasoning. 1 Although Dalí was part of the Surrealist movement, he was expelled from the official group in 1934. 2 Matthew Kieran, “Aesthetic Value: Beauty, Ugliness, and Incoherence,” Philosophy 72, no. 281 (July, 1997): 386. I have been reading Letters of a Portuguese Nun, a collection of 17th century letters that purportedly were written by a Portuguese nun to a French army officer. These letters were published and republished many times in the 17th and 18th centuries; they were very popular because of their alleged authenticity. It was thought that the letters were written by the nun Mariana Alcoforado to her lover Noel Bouton, the Marquis de Chamilly. Since the 20th century, however, the authenticity of the letters has been debated (although Miriam Cyr recently wrote a book arguing that Mariana is the author – you should look at this entertaining customer review that proclaims Simon Schama’s affinity for Cyr’s book.). This went on sale at Christie’s this week. See the lot description here. 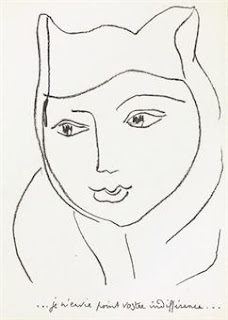 I have read in multiple sources that Braque also painted a picture of Mariana, but I haven’t been able to find a reproduction anywhere. If anyone knows where I can see a copy (or the original! ), please let me know. The first time I heard about Cellini was not in an art history lecture, but while watching How to Steal a Million (1966, starring Audrey Hepburn and Peter O’Toole). Even though there really isn’t a Venus sculpture by Cellini, this film is really fun – especially if you like stories about art crime and forgery. 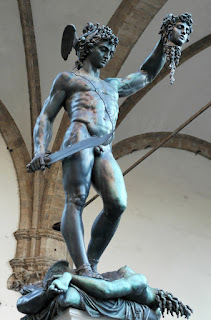 You can read Cellini’s dramatic account of casting Perseus here. 1 Emma Barker, Nick Webb, and Kim Woods, eds., The Changing Status of the Artist, (London: Yale University Press, 1999), 99. What Old/Castaway Object Embodies You? I think it’s cool that Jean Shin’s sculptures and installations are made out of castaway objects. 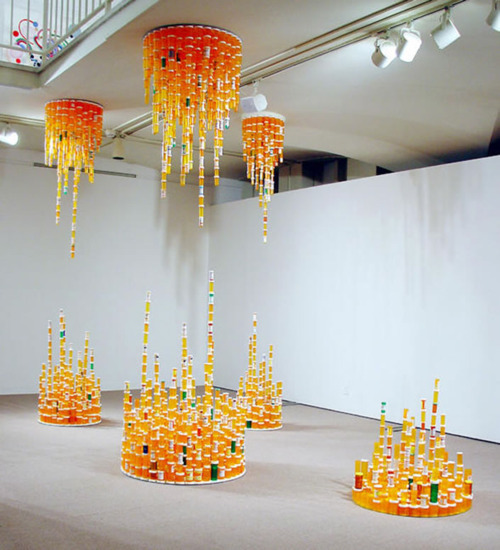 Her work on the right, Chemical Balance (2005), is made with prescription bottles, mirrors, and epoxy. Other sculptures are made out of broken umbrellas, old lottery tickets, worn shoes, etc. You should check out Shin’s work on her website – it’s really neat. I really like her Sound Wave (2007, made out of records) and Worn Soles (2001). I really like the idea of Shin’s work as group portraits. It made me think about what kind of objects could be considered as my own portrait. I thought of all the buttons in my sewing box. They are all of the extra buttons that came with the different shirts, pants, and shorts that I have owned. Some of the clothing has been long-gone, but I’ve never taken any of the old buttons out of my stash. I guess if there was a Jean Shin-esque sculpture made as my portrait, it could be of buttons. What about you? What old/castaway objects could be your portrait? What works by Shin do you like?